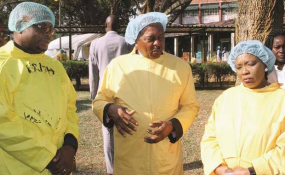 First Lady Auxillia Mnangagwa is briefed by Health and Child Care Minister Dr Obadiah Moyo, centre, while Primary and Secondary Education Minister Professor Paul Mavima looks on during a tour at Beatrice Road Infectious Diseases Hospital in Mbare, Harare. Government has with immediate effect banned public gatherings and food vending in Harare as part of measures to contain the cholera and typhoid outbreak. Cholera has so far killed 21 people and 3 000 others have been treated of the disease. Deaths from suspected cholera will only be handled by health personnel and the same applies to funerals. The Zimbabwe Republic Police has also been roped in to ensure adherence to these measures, while health teams are working flat out to manage all identified suspected cases. In a statement to The Herald yesterday, police spokesperson Senior Assistant Commissioner Charity Charamba said the ban was with immediate effect. "The ZRP wishes to advise all Budiriro and Glen View residents that police officers will enforce Government policies and directive to ban and stop food vending with immediate effect," she said. "In the same vein, Government has banned illegal food vending in Harare Central Business District through street corners, vehicle boots or back offices where food is being sold. The ban affects both day and night vending." Snr Asst Comm Charamba said police were going to be deployed around the city to ensure compliance. "In this regard, police will intensify patrols and surveillance in the Harare Central Business District and will be out in full force to ensure compliance with the Government directive without fear or favour," she said. Snr Asst Comm Charamba urged the public to comply. Addressing journalists soon after an all stakeholders cholera meeting in Harare yesterday, Health and Child Care Minister Dr Obadiah Moyo said the measures were meant to effectively contain the outbreak. Dr Moyo said cholera cases were increasing on a daily basis and there was need to ensure coordinated response as well as taking drastic measures. "As far as cholera is concerned, the number of cases have increased," he said. "They are increasing on a daily basis and as of this afternoon the figure stood at 3 067 cases. A majority of these cases are emanating from the same epicentre of Budiriro and Glen View areas. The number of deaths has also risen to 21." Dr Moyo said measures put in place were also meant to ensure that the outbreak does not get worse like what happened between 2008 and 2009. In 2008 and 2009, over 4 000 people died of cholera, while about 90 000 were treated of the disease. "We should not be seeing any deaths as a result of cholera or typhoid," said Dr Moyo. "These are diseases which can be managed to avoid death. So, we have all agreed that we are going to take drastic action to combat these diseases from spreading further." Dr Moyo said although the outbreak spread to other parts of the country, the epicentre remained in Harare. "Those who have been identified in other parts of the country to have the diseases, especially cholera, are being managed appropriately except for one death which occurred in Masvingo," he said. "Most of the deaths have occurred in Harare. So, we are concentrating with Harare." On vendors, Dr Moyo said the municipality had failed to effectively control them, hence the roping in of the police. "It is essential that vending is stopped, especially in the area of Glen View and Budiriro," he said. "Eventually we would want to see vending being directed to appropriately designated areas after facilities have been constructed and designated." Dr Moyo said Government would continue disseminating health education to the public on ways of preventing and controlling the spread of diseases such as cholera. Harare City Council acting town clerk Engineer Hosiah Chisango said the municipality was working flat out to repair blocked sewer and restoring water supplies in the affected areas. He said Glen View 8 had no tap water on Tuesday because his team was working on blockages in the area, requiring temporary closure of water supplies. Questioned on the slow pace by council to attend to blocked sewer, Eng Chisango said the municipality experienced revenue challenges, forcing it to introduce promotions on rate payments to increase its revenue. "Ordinarily, we should be able to attend to all reported blockages or bursts within 24 hours, but of late we have been facing challenges with our revenue," he said. "This is why we had to introduce certain promotions to try and increase our revenue base."